Being married to a dress maker, this project really resonates with me. 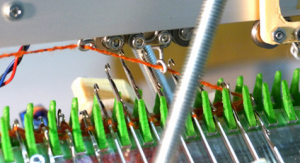 The people over at OpenKnit have created an open source knitting machine. This takes home production to a new level. I get the impression that open source support for making garments really is growing these days. For instance, Valentina is an open source pattern making program. To complete the picture, do pay a visit to doKNityourself, a site aiming to be the Thingiverse of open source garments.